Salisbury – Up for another Cup! Talking Bull > Latest > Salisbury – Up for another Cup! Who knew that chance is so sadistic? Ian Long’s warriors in the FA Cup, a return to Coles Lane, and now another Cup trip to Salisbury.. Shake those balls more vigorously, chaps! The Salisbury Ground Guide, by Simon Wright. With two visits in the last four years, its “been there, know about that” for the majority of the Beadle backers. 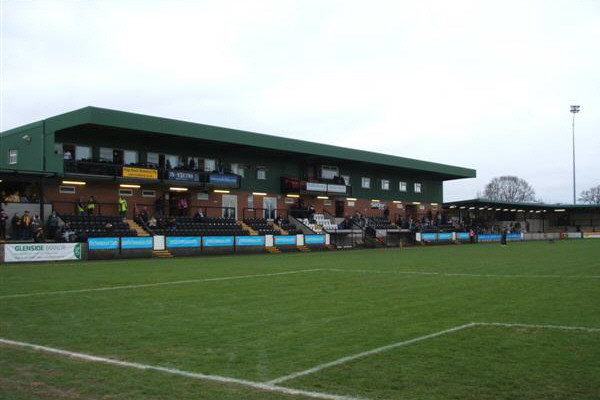 Salisbury regularly wax lyrical that their stadium is modern and purpose built – both true – though their claim that the ground can “technically hold 5,000” feels rather odd. “Technically”, Edgar Street can hold 18,000 because it has in the past but no-one would ever sign off a Safety Certificate for that amount. The Ray Mac’s record attendance of 3,450 was set in March 2016 for the Wembley showdown, some 500 below their real ground capacity. This season, our fellow Phoenix club is averaging around 600 supporters for their League and Cup games. Their turnover in playing personnel has been considerable over the summer which may explain their slightly disappointing start, losing their first two away games. Since then, their form has picked up considerably. They have a larger first team squad than the Bulls, including 4 loanees from higher League clubs. Both familiarity and travel time (this is another three-hour road journey) will reduce our travelling numbers It’s not yet clear where any segregation will be enforced. Hopefully not as the ground is unlikely to be more than 25% full. Supporter interaction at Step 4 is one of the simple pleasures. Interesting to see that Salisbury have promoted this game (and our League game in March 2017 too) since July, keen to fill their executive boxes. The obvious local drinking venue, The Old Fort (a Harvester pub/ restaurant) was simply swamped in the Vase. There is a bar area for those who don’t want to eat and there are outdoor facilities if warm enough. There is no real ale available. The Old Fort (SP1 3SD) is a mile distant from the Ray Mac. Such was my gibbering state of tension that day, I was unable to find the Old Sarum Airfield which unhelpfully wasn’t signposted from out of town. Now free from immediate Wembley dreams, I shall try again as their Skies Café (SP4 6DZ) serves homemade food (from 8.00 am) plus beer and cider. If it’s anywhere near as charming as Shobdon Airfield, this will be a treat. Culture lovers arriving early might like to visit the famous ruins of Old Sarum Hill Fort, the original location of Salisbury. Or divert to Stonehenge for vital selfies. By Road: only 99 miles (SP4 6PU) but with no motorways, this is tediously slow. Take A40 to Gloucester, then A417/ A419 towards Swindon. On outskirts of Swindon look for A346 Marlborough. Follow this which then morphs into A338. As you approach Old Sarum, look for a roundabout where you carry on into Portway. Then turn right into Partridge Way. Drive through a modern housing estate (to the ground. Parking is in a handy field, where the signage may be in Welsh again. Sigh. Alternatively, take the main road route. Longer. But quicker. Take the M4 to junction 13, then the A34 to Andover turn off, onto A303 until A338 junction, then directions into Salisbury as above. By Train: Can be done with a change in Bristol but without any discounts expect a £50+ fare. You’ll need a Salisbury Reds bus No 5 or a taxi from here.